I crowed a great deal about this little project on Facebook just before Christmas, but I have to say I am still very proud of it. I am giving it a little post of its own because I am starting a new section in my “Articles” Page on this website on gifts for children under 7. I hope to expand this to a section for chidlren OVER 7 – because they are the ones that puzzle me at gift-giving times, but for now I will stick with what I know! This little vest is very versatile, and I was heartened to spot its potential when Kaelan was hovering about watching me make it. Sadly, it wasn’t for him, and sadly I ran out of fabric to make two of them, but as you will see I came up with another idea for him later on. 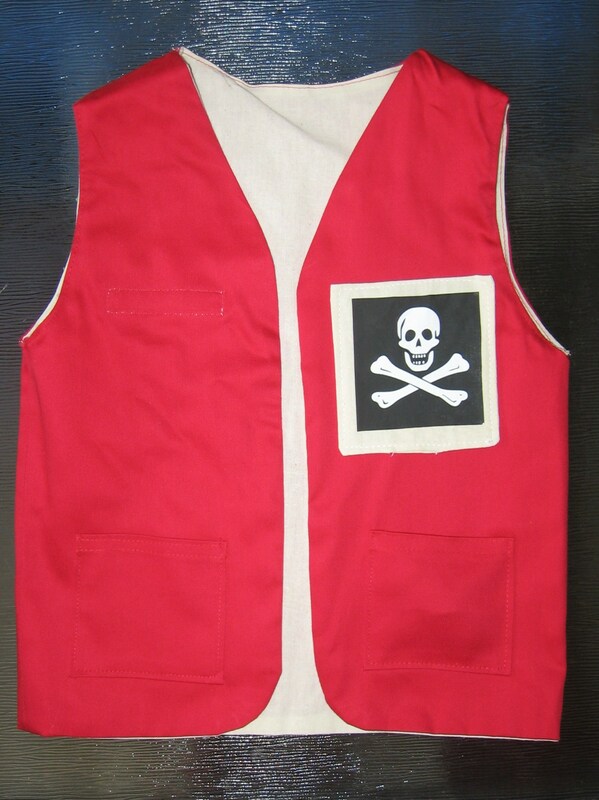 The vest can be worn on the red side or the white side, and the badges are velcroed on so that you can change them according to which Emergency Service is required the most urgently … and if you are feeling a little dastardly then there is a Pirate badge for those moments too. We can’t be good all the time. 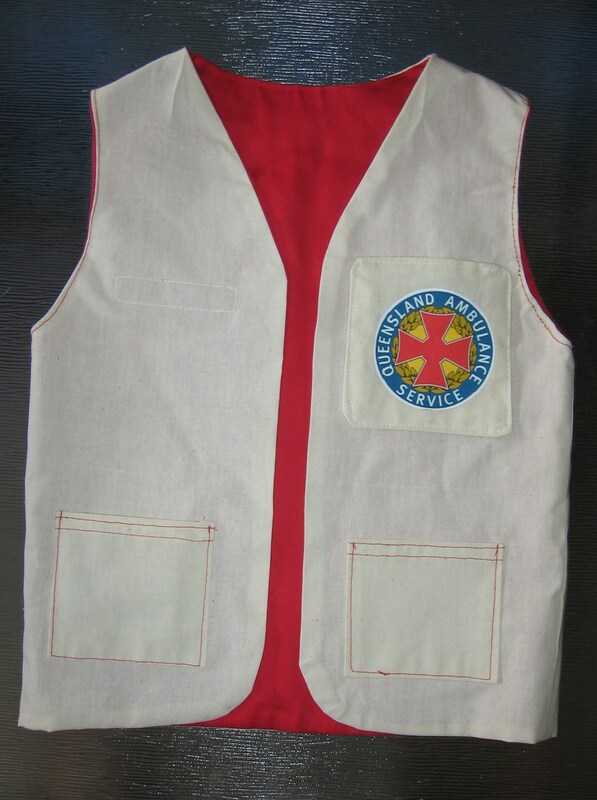 The badges were made by printing off the crests from the internet onto iron-on transfer paper. They were then ironed on to some simple calico squares that I had made up with another piece of velcro on the back. 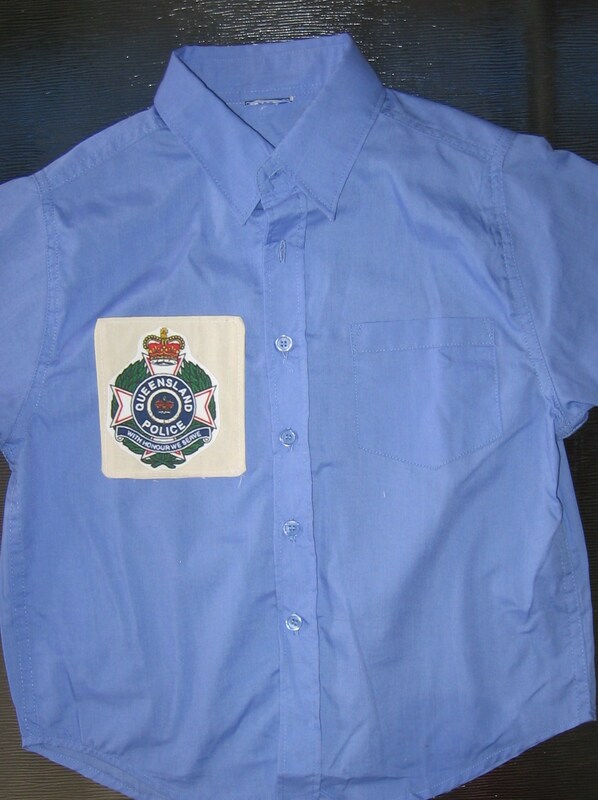 For Kaelan I found a rack of these blue button-up ‘work’ shirts in a local op-shop (thrift store, for our overseas readers! 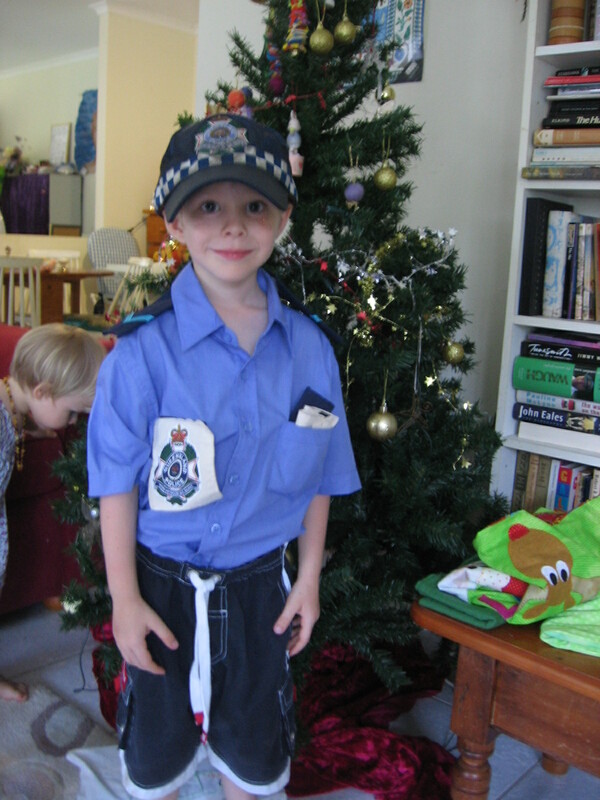 ), and so having run out of time to obtain more fabric I added some velcro to his shirt, and my brother bequeathed Kaelan some old police badges and hat (including a badge that says “Donut Police: Protect the Donuts” hee hee). Heaven. Kaelan wore it all for three days and nights before I decided it could do with a wash. That’s the sign of something appreciated isn’t it? Here he is with his badges in his pocket, ready to change at a moments notice.